Felix Thornley Cobbold was born at Holy Wells Mansion, Ipswich, the eleventh child and youngest son of John Chevalier Cobbold (1797-1879) and his wife Lucy Patteson (1800-1879). He was a King’s Scholar at Eton, matriculated at Trinity College, Oxford, took a BA and MA at King’s College, Cambridge where he was sometime second bursar and a Senior Fellow, a position he retained for life. He was called to the Bar at Lincoln’s Inn but practiced only briefly, before returning to King’s College as bursar in 1871. Felix was persuaded by his father to return to Suffolk to take up his interest in the family businesses, including Cobbold & Co., Brewers and Merchants in 1876 following the untimely death of his elder brother John Patteson Cobbold. 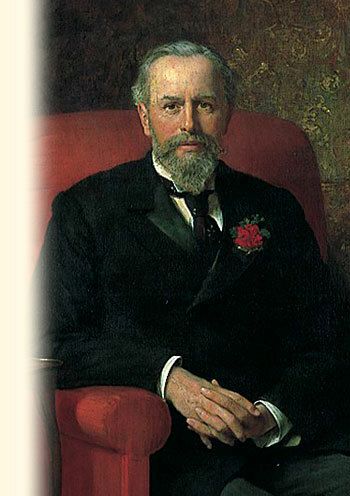 Another brother, Nathaniel Fromanteel Cobbold died in his forties and Felix Thornley assumed his interests in Bacon, Cobbold & Co., Bankers (now Lloyds TSB plc). He became an extremely wealthy man, and in common with his forbears used his wealth generously to benefit the community. He donated to Ipswich, land for St Clement’s Baths; a clock and carillon for St Clement’s Church and 45 acres of Gippeswyk Park plus cash for fencing. In 1894 he purchased Christ Church Mansion from a syndicate which proposed to demolish it for redevelopment, and presented it to the Borough of Ipswich to establish a Museum and Art Gallery, and in his will left a further £20,000 in Ipswich Stock, the interest of £600 per year accruing therefrom to be used for the purchase of artworks. Although he came from a staunch Conservative background, his father and two brothers served as Tory MPs, Felix Thornley Cobbold was a Liberal of the crusading kind. He argued fervently to extend the franchise, and in the election of 1885 he was returned as Member of Parliament for Stowmarket with a substantial majority. He disagreed with Gladstone over Home Rule, and did not stand for re-election in 1886. In 1900 he contested Woodbridge as a fervent opponent of the Boer war, but lost. However, five years later he was again returned to Parliament as Member for Ipswich with a huge majority, and continued his parliamentary work right up to his death in Whitehall Court, London, on 6 December 1909. His great agricultural legacy was his endowment of the Trust founded in his name after his death. He was a champion of the independent smallholder, and recognised the importance for farmers and farm workers to be trained in the best farming practices. His own farm at Felixstowe was described in an obituary as "Being on a high scale of perfection indeed. His crops were fine, his cattle of the best, his fields faultlessly clean, and his personal interest in the farm keen and thorough." It continues, "Convinced of the system he turned precept into practice, and before his death had probably the largest roll of allotments and small holders of any landowner in Suffolk." His patronage of agriculture is continued by the Felix Thornley Cobbold Agricultural Trust through the award of grants for the betterment of farming practice in Suffolk and the adjoining counties.